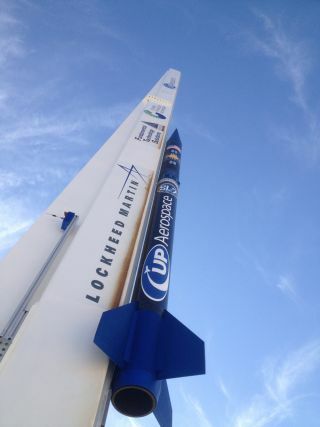 UP Aerospace SpaceLoft 7 rocket mounted on launcher the day before launch. Seven space-technology experiments are slated to blast off Friday (June 21) on a NASA-funded suborbital research flight. A SpaceLoft sounding rocket, built by Denver-based UP Aerospace Inc., is scheduled to launch from New Mexico's Spaceport America between 9 a.m. and noon EDT (1300 to 1600 GMT) on Friday. The 15-minute flight is expected to reach a maximum altitude of 74 miles (119 kilometers) and provide up to four minutes of weightlessness for the onboard experiments. Landing is targeted for the U.S. Army's White Sands Missile Range, about 320 miles (515 km) from Spaceport America, NASA officials said. UP Aerospace personnel load a technology payload into the nose of the firm's SpaceLoft 7 suborbital rocket at Spaceport America in New Mexico. The rocket is slated to carry seven experiments into suborbital space on June 21, 2013. Among the seven payloads aboard the 20-foot-long (6 meters) rocket is the U.S. Federal Aviation Administration's Automatic Dependent Surveillance-Broadcast (ADS-B), a tracking device being developed for use in air traffic control systems. Current plans call for all aircraft operating in U.S. airspace to be equipped with ADS-B by 2020. Two high school science experiments are also riding along on Friday's flight, as is Diapason, an instrument developed by DTM Technologies in Italy to study the movement of very tiny particles in Earth's atmosphere. Diapason could help identify and monitor atmospheric pollution and contaminants, NASA officials said. UP Aerospace isn't the only company with a NASA contract to make technology-testing suborbital research flights. The space agency has also signed deals with Virgin Galactic, Masten Space Systems, Near Space Corporation, XCOR Aerospace, Whittinghill Aerospace and Armadillo Aerospace. NASA manages such launches via its Flight Opportunities Program, which matches payloads with flights and pays launch costs (though no funds are provided for development of the payloads). The program should help the burgeoning American private spaceflight industry get off the ground, agency officials say. "The Flight Opportunities Program fosters the development of the commercial reusable suborbital transportation industry, an important step in the longer-term path that envisions suborbital reusable launch vehicles evolving to provide the nation with much lower-cost, more frequent, and more reliable access to orbital space," NASA's Flight Opportunities Program website states.